Tanaka,J.,& Utsuki,N. (2010).Emotlonal lntelligence of Japanese University Students and Employment Offrs.Journal of Intercultural Studies,35,157-180. Hayashi R.et al.”Elicitation of N400minsentence comprehensiondue to lexical prosody incongruity”,NeuroReport,Vol.12,No.8,1753-1756,2001.林良子他「MRl動画による英語音声の調音動態の観察―日本人英語学習者との比較―」,「日本音声学会全国大会予稿集」,91・96,2011,(共著書)「クリン・クラン―ドイツ語初級文法と発音」,朝日出版社,2011,「イタリア語スピーキング」,三修社,2011. Taira Yoda,Hidenari Kiyomitsu,Kazuhiro Ohtsuki,Jun-ya Morishita,”An Extended AND Operations for Retrieving a Flexible lnformation Unit from Tree Structured Data,”Proc.of International Symposium on Appllcations and the lnternet Workshop (SAINTW’07),pp,53-56,2007. 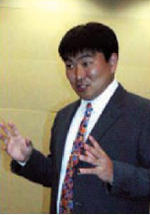 Hidenari Kiyomitsu, Atsunori Takeuchi and Katsumi Tanaka,　”Web Reconfiguration by Spatio-Temporal Page Personalization Rules Based on Access Histories,”Proc.of 2001 Symposium on Applications ard the Internet(SAINT 2001),pp,75-82,IEEEPress,January 2001.